Yesterday, the boys of SHINee performed their goodbye stage for “Hello“, and member Jonghyun thrilled his fans with an expression of his deepest apologies. 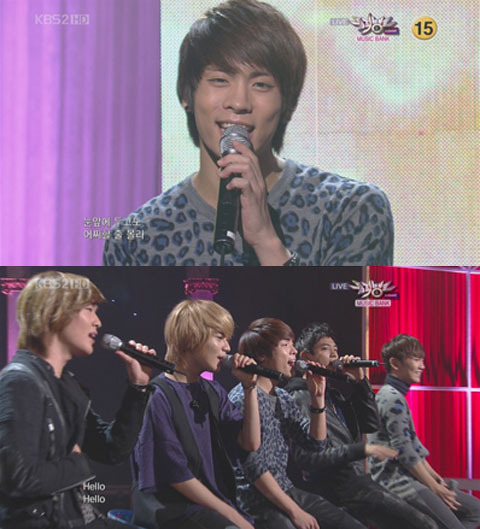 In the beginning of their performance, the usual screams for Jonghyun were noticeably muted – an indication that most of his fans were still unable to accept the news of their favorite idol dating actress Shin Se Kyung. Yet eventually, as the song progressed, they were able to discard their initial anger and cheered loudly for Jonghyun. After SHINee concluded ‘Hello’, Jonghyun stood up from his chair and delivered three sets of deep 90-degree bows. In Korea, a bow serves to indicate the individual’s respect or apology towards the other – the deeper the bow, the more remorseful/respectful the individual feels. In this case, Jonghyun’s bows communicated his deepest apologies towards his fans for the emotional impact his dating status caused them. It’s a sweet gesture that will hopefully alleviate their anger, despair, and anguish. Perhaps it may encourage fans to accept his status and continue to support their favorite idol. This entry was posted on October 31, 2010 by heedina. It was filed under Boy Band, News and was tagged with Shin Se-kyung, SHINee, SHINee jonghyun.